Ketchikan: Worman Keeps Top Spot; Overall Fish Count More Than Doubles 2010 Week Two Results - More than 800 anglers made their way out onto the water over the weekend to participate in the 64th Annual Ketchikan CHARR King Salmon Derby. Although roughly the same number of anglers that checked out during Week 2 of the 2010 derby, the fish count was up by more than double. 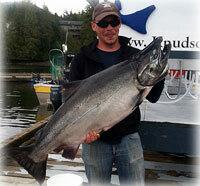 459 king salmon were entered over the weekend, compared with just 197 during week two of last year’s derby. “All of the weigh-in stations commented on how busy certain times of the day were compared to last year,” said Russell Thomas, 2011 derby coordinator. “The weather seemed to hamper participation some on Saturday but a lot of fishermen took advantage of the good weather and the good fishing on Sunday.” Thomas expects similar levels of participation and potentially better fishing during the final weekend of the derby. No changes were recorded in the top three ladder positions in the second weekend of fishing. Kyle Worman continues to lead the way with a 49.7 lb king, weighed in just hours after the derby began last Saturday. Worman’s fish would have won every Ketchikan derby since 2006 but he’ll have to endure one more weekend of anticipation to see if his fish will capture him the derby’s grand prize, over $10,000 in cash. Some large fish were entered during the second weekend, knocking anything under 30 lbs from the thirty-place adult derby ladder. Ketchikan: Coast Guardsmen investigating grounded tour vessel - Coast Guardsmen in Southeast Alaska responded to a grounded vessel near Ketchikan Friday. Coast Guard Station Ketchikan and Marine Safety Detachment Ketchikan personnel responded to the 108-foot motor vessel Aleutian Ballad after the vessel struck a rock and sustained damage. The Aleutian Ballad offers the Bering Sea Crab Fishermen's TourTM in Ketchikan. Southeast Alaska: NOAA seeks information from public on marine mammal deaths near Skagway - It has been a deadly 2011 for marine mammals in the Skagway area. Since January, the carcasses of two Steller sea lions and three harbor seals have been discovered. Of the five deceased mammals, four showed signs of head trauma, and a bullet was recovered from one harbor seal skull during a necropsy. NOAA's Office of Law Enforcement is asking the public for help in determining exactly what is causing these deaths. "One Steller sea lion appears to have died from illness," said NOAA Fisheries' Aleria Jensen, marine mammal stranding coordinator for the Alaska Region. "The other Steller sea lion and the three harbor seals showed signs of trauma to the head indicative of marine mammal-human interaction." "We are currently investigating these incidents," said NOAA Assistant Special Agent-in-Charge Ron Antaya. "However, any information that can be provided by the public would be welcome and could help to resolve these matters more quickly." Alaska Science: Fire is a natural part of the boreal forest ecosystem By NED ROZELL - With their mushroom clouds topped with cauliflower crowns, plumes from wildfire smoke are again a common sight in Interior Alaska, which - with barely a sprinkle of rain - just experienced one of the driest Mays in the 100-year written record. 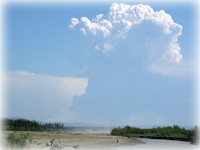 The plume from a 19,000-acre fire near Volkmar Lake in Interior Alaska on May 29, 2011. Though it’s a normal human reaction to think of wildfire as a bad thing, fire’s occurrence on the landscape predates the arrival of people to the boreal forest by a long shot. The forest doesn’t function well without it. In researching the topic, I came across a previous interview with Tom Paragi, a wildlife biologist with the Alaska Department of Fish and Game in Fairbanks. Paragi’s specialty is the ecology of disturbances to the boreal forest, among them logging and the effects of wildland fires. The following is from a column I wrote in 2006 with him on the subject of wildfires. I told Tom that the word “ravaged” came to mind when I walked through a burned spruce forest and saw the charred bones of red squirrels. He countered by saying that red squirrels have the unfortunate tendency to seek shelter in spruce trees when something threatens them. Other small mammals, such as voles on the forest floor, might survive a fire because the soil around them is wet enough not to burn. 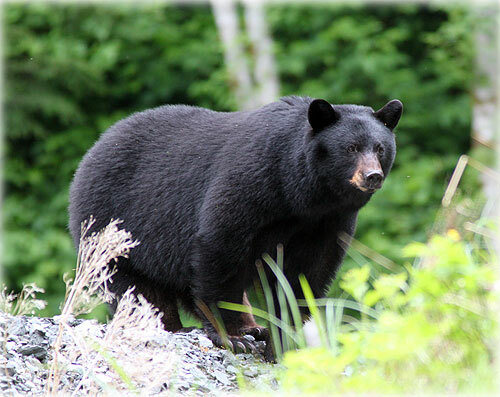 Larger animals move fast enough to escape slow-moving wildfires typical of the boreal forest, he said.